ATENA is used to simulate the failure of masonry arch bridges and to prove their structural safety under given live loads. 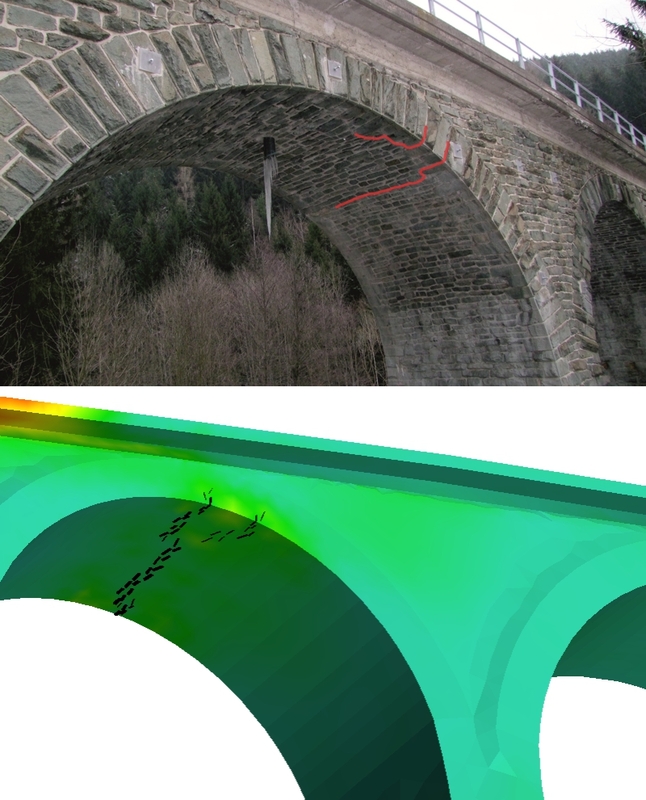 In addition to the exact geometrical modelling of the bridges including the surrounding soil, the nonlinear 3D Finite Element analyses allow to simulate masonry cracking. As a result, comparatively realistic analysis models are obtained. The crack patterns in the simulations may directly be compared to those observed at the real structures. This allows to identify causes of damage and to evaluate the effects of strengthening measures. In the below-mentioned paper, it is demonstrated that different damage patterns of masonry arch bridges may be reproduced by nonlinear Finite Element simulations. For this work, the author received the Young Engineers Innovation Award for Structural Maintenance 2014 (Nachwuchs-Innovationspreis Bauwerkserhaltung) granted annually by the Bundesverband Feuchte & Altbausanierung e.V. in Germany. Stephanie Franck (2014). Nachbildung von Schäden an Mauerwerksgewölbebrücken mittels nichtlinearer Finite-Elemente-Simulationen. BuFAS e.V., Altbausanierung 9, 25 Jahre Feuchte & Altbausanierung, 25. Hanseatische Sanierungstage, 30. Oktober – 1. November, 2014, Heringsdorf / Usedom, Fraunhofer IRB Verlag, Beuth Verlag, Berlin, 175-184.